The definition of culture as connected with our subject must be a very simple one. The Greek culture of Plato may have made its way into the enlightened minds of some of the scholarly men that penetrated into the wilds of the Northwest, but speaking in a general way the culture of Goethe or of Mathew Arnold would not be dreamt of in the philosophy of Red River. It will be sufficient for our purpose to define the term as something analogous to making the best of oneself under difficult circumstances. The Red River settlement, in a great measure owed its origin to the fur-trading companies, who, first of white men were the explorers and settlers of the remoter parts of British North America. It would be well, therefore to extend our geographical limits and give a short 'historical sketch of the Influences that affected Red River and eventually made it the centre of culture in the Northwest. It will be unnecessary to go back to the time when in 1670 the Hudson's Bay Company received its charter and took possession of the inhospitable shores of Hudson Bay. Any evidences of literary ability in that early period or indeed in the following century, are contained in the writings descriptive of the contests of the company with the French, who claimed the bay on the plea of priority of discovery, and of explorations into the interior of the country or in search of a Northwest Passage. These writings can hardly be said to belong to the culture of the Northwest. The reminiscent lone of Red River gives us glimpses of the social customs that prevailed at the forts on the lonely shores of Hudson Bay. These forts, at first mere huts, surrounded by stockades, grew in time to be commodious and comfortable establishments. The denizens of one of these forts would gather in a large room of an evening. The immense open fire place in use before the Carron stove was imported, gave forth a ruddy glow and comforting warmth. The handsome polished mahogany furniture brought out from England reflected and added to the brightness. The evening was not infrequently enlivened by dancing to the sound of the violin. Most probably the dances in vogue were of the kind described by George Eliot as "The angular dances of our northern clime," meaning the Scotch reel and strathspey. In the history of the fur trade there arose a time of storm and stress when the Hudson's Bay Company had to contest with other companies from Montreal the right to engage in the fur trade in the interior of the Northwest. This period may be said to have commenced in 1787 and closed in 1821, when the two great companies that survived the struggle, the Northwest and the Hudson's Bay Company, united their forces and became henceforth known as the one great fur trading company of the Northwest and the Hudson's Bay Company. As may well be understood this period was most unfavorable to culture, or indeed to social advancement of any kind, and we find in the correspondence of the time sad reflections on the injurious nature of the contest, which affected not only the character of the Indians who came under the influence of the fur traders, but that of the bourgeois, chief factors and clerks themselves. It is said that in the petty kind of warfare that was waged men of honor were led to do things in the interests of their companies that in private life they would have held in utter contempt. And yet it was a period of brilliant achievement in exploration and discovery. In that short but troubled epoch the Coppermine and the Mackenzie Rivers were made know to the world, and no less than five great journeys across the Rocky Mountains to the Pacific coast were undertaken and brought to a successful issue. These enterprises reflect undying glory on the Anglo-Saxon name and fame and they have all been ably described in most interesting books and journals showing that the men who thus penetrated into the wilds of the far north and west were men of considerable culture and literary ability. But the central literary figure of this period was Roderick Mackenzie cousin of the great explorer, Alexander Mackenzie Roderick Mackenzie came to Canada from Scotland when quite a young man, in 1784. He joined one of the smaller fur trading companies and their union associated him with the North-West company. By his marked ability he soon rose to the highest rank in the Northwest service, and we find him in charge of the Athabasca region in 1785. He is said to have been a man of solid and even brilliant education. He built for his company the famous Fort Chipewyan on the south shore of Lake Athabasca-not the present fort which stands on the north shore, but the one which was deserted in 1820. Mr. Mackenzie was very proud of his fort, of its site and all its appointments. He tried to make it a sort of "Tadmor in the wilderness," or as he called it, "A Modern Athens." He embellished it within and without so that it was a marvel to the savage races who congregated there for purposes of trade as well as to the coureurs des bois, who regarded it as the paradise of the fur trader. He made a fine collection of books, which was called the Athabasca library, as it was intended for circulation among the forts of that region. A writer of the time says that after -Mr. Mackenzie left Athabasca the library was scattered and much abused, but as Lieut. afterwards Sir Henry Lefroy, who made a magnetic survey of these northern countries for the British in 1842, passed a winter at Fort Chipewyan and mentions spending many happy hours in the well selected library of the place we may imagine it was rearranged and added to from time to time. It had been suggested to Mr. Roderick Mackenzie when in the Athabasca region that he should write a history of the 'transactions of the Northwest company for the company, and he was ambitious himself of producing a work on the aborigines of British North America. In order to gather information for these literary efforts he formed a circle of correspondence which covered a very wide area of the fur trading country. This correspondence was continued after Mr. Mackenzie left the Athabasca region and became an agent for 'his company in Montreal, and even after he had retired to spend his latter days at the seigneury which he purchased at Terrebonne in the province of Quebec. In the correspondence the letters of Sir Alex Mackenzie bulk largely. The most affectionate relations seem to have existed between the two cousins even at a time when they took different sides in a quarrel of the fur companies. and we find in Sir Alexander's letters expressions of solicitude for his cousin's comfort in the far north, saying on one occasion that he has sent him mittens to protect his hands when fishing, and he often makes mention of books that he has taken the trouble to procure for him and to forward for his use. Sir Alexander profited much by Roderick's assistance in preparing the journal of his discoveries for presentation to 'the company under whose auspices they were undertaken and later to the public. Other correspondents were Angus Shaw, of Lac d'Orignal, west of Edmonton, who had been a helpful friend to Roderick Mackenzie in his early career; Mr. George -Keith, who spent most of his life in the dreary departments of Athabasca and the Mackenzie rivers; Duncan Cameron, of Nepigon, afterwards famous as an opponent of Lord Selkirk, at Red River; Peter Grant, of Rainy Lake and Red River; John Johnston, of Sault St. Marie, whose romantic love story and his marriage with an Indian princess, added interest to his contribution; Willard Ferdinand Wentzel, a life long friend of Roderick Mackenzie, but -who spent most of that long life in the desolate regions of the north, and Charles Mackenzie who gives a vivid account of two important journeys he made to the Mandans of the Missouri. Thus the ground was well covered and as the writers were sometimes moved from place to place they had opportunities of extending their spheres of observation. The knowledge contained in these letters is almost as extensive as that of Solomon under different circumstances. They treat of the folk-lore, languages and customs of the Indian tribes, of the variations of climate in different parts of the Northwest, of the trees, herbs, fruits and wild flowers, indigenous to the countries described as well as the personal experiences and adventures of the writers. Mr. Mackenzie's literary intention was never carried out, but the correspondence has been edited and published by L. M. Masson, ex-governor of Quebec, who married a grand-daughter of Roderick Mackenzie and it has been a perfect mine of wealth for subsequent historical and scientific writers on Northwest subjects. We learn from this correspondence that music was cultivated in some degree at the forts of the Northwest. Willard Ferd Wentzel, one of the most interesting of the letter writers, because of his liveliness and humor, was evidently a musician. Sir John Franklin, whom he accompanied as far as the mouth of the Coppermine River in 1819, says he was a very good musician and he (Wentzel) sometimes expresses a wish in his letters that his friends would send him some new music. Of course the musical instruments in vogue in those remote latitudes would have to be of the size that could "Travel with the cooking pots and pails," or be "Sandwiched 'twixt the coffee and the pork." And so we find that Wentzel excelled in playing upon the flute and the violin, the most portable and hence the most common instruments in the northern forts, although we sometimes meet with mention of the bag-pipes as being used to "discourse most excellent music." In addition to the correspondence and journals just mentioned we have two writers of this period that are worthy of notice. Alexander Henry, Jun., a bourgeois of the Northwest company, has left a voluminous and entertaining journal, commencing its record in 1799 and continuing with but one break of two years, until the author's death by drowning in the Columbia river in 1814. Dr. Coues, a late American writer, has edited this interesting Journal and pays a high compliment to the writer of this work, taking notice of the business-like way in which he records his affairs and the suitable choice of language he makes in treating his subjects. An authentic copy of Henry's journal is preserved in the parliamentary library at Ottawa and a copy of that copy has recently been ordered for the consulting library of the Historical society of this city. The journal of Daniel Williams Harmon, a native of Vermont, who entered the service of the Northwest Company in 1500 at the age of 22, is written in a different style. The daily records given have a more natural movement, as the journal was not written for a purpose, as most of the others were. It gives a closer glimpse into the family life of a bourgeois of that time. This journal was edited and given to the public by Daniel Haskell, a Puritan minister of Andover, Mass., in 1820 Harmon spent a number of years in the Swan River district and when at the forks of the Saskatchewan in 1505 he married a French half-breed girl 14 years of age. The fortunes of the fur trader took him to many different points in the fur country and we find him, about five years after his marriage, in New Caledonia. A most pathetic passage in the journal gives an account of the death of his little boy, George Harmon, whom he had sent, when only three years of age, under the care of a friend, to bed brought up and educated among his kindred in Vermont. The death thus taking place in absence was a source of intense grief to Harmon and his wife and from that time we find evidences of serious thought and religious development in the journal. -We have allusions also in the journal to the pleasure Harmon took in personally educating his children and to the instruction he gave his wife in the truths of Christianity. The time came when Harmon decided to leave the service and give his family the advantages of civilized life and the account he gives of the circumstances of his journey when accompanied by his wife and children he bade adieu to the wild fur country reads almost like a chapter of romance. Miss Harmon, his youngest daughter, conducts a well known ladies' school in Ottawa and she holds the memory of her father and mother in the greatest reverence. The remarkable year of 1821 which witnessed the amalgamation of the Northwest Company with the Hudson's Bay Company brought a period of peacefulness which was chiefly prolific in personal correspondence among the chief factors and the traders of the united corporation. As Mr. Roderick Mackenzie was the central figure of interest in the former period so Mr. James Hargrave appears in the latter. Mr. Hargrave was stationed for a number of years at Fort Garry and afterwards for a lengthened period at York Factory. The latter place was the chief port of entry to and from Rupert's Land and his position there brought him into correspondence with nearly all the leading men of the country. He rose to the position of chief factor in the service of the Hudson's Bay Co. It is to be regretted that we have none of Mr. Hargrave's own letters, only those of his correspondents have been preserved and they date from 1821 to 1859. Among these correspondents we find the name of Geo. Simpson, afterwards Sir Geo. Simpson, the autocratic governor of the Hudson's Bay Company, who, indeed, was sometimes styled the emperor. He writes from Norway House, from Red River and sometimes from London, England. Other writers were Arch deacon Cochrane, of Red River ; Bishop Provencher, Rev. David Jones, Acting Governor Bulger, Cuthbert Grant, the Bois-Brule leader, who after the stormy period of the Selkirk settlement had made a peaceful 'home for himself at White Horse Plains, Trader Sieveright; Mr. Connolly, chief trader New Caledonia; J. G. McTavish, of Fort Churchill, and Mr. Geo. Barnston, a very intimate friend of Hargrave. These all give their varied experiences. The local governors, Finlayson and MacTavish, are well represented, as well as Alexander Ross the historian of Red River. Sir George Simpson in one of his letter states that Sir Walter Scott has just passed away. 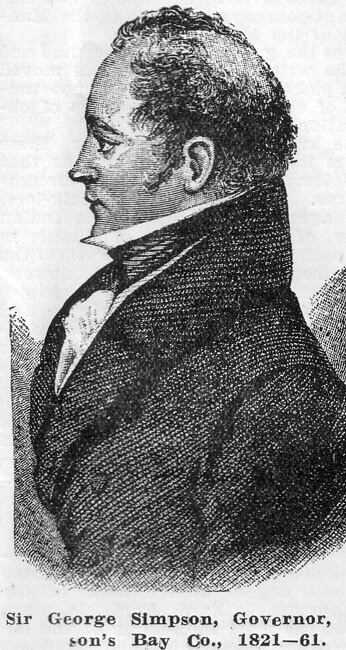 He thanks Hargrave for copies of Blackwood's Magazine and gives orders for some new books of the season In a 'letter from Chief Factor Stuart, New Caledonia, he speaks of wishing to see the continuation of Southey's "Peninsular War,” and says he has ordered Napier's History of the Peninsular War. Many other allusions are made in the correspondence to books and magazines received or exchanged, which shows that these men, isolated as they were, took an interest in current event and were on the outlook for the best literature of the time. The duty laid upon them of keeping for the benefit of their employers a diary recording everything at their posts that might make one day differ from another, or indeed that often made every day alike, cultivated among the officers of the fur trade the powers of observation that were frequently turned to scientific account, and we find some of them acting as corresponding members of the Smithsonian Institution in Washington. Valuable collections in natural history have been forwarded to the institution by such observers as the late Hon. Donald Gunn, the late Mr. Joseph Fortescue and Mr. Roderick Ross Macfarlane. Mr. Wm. Barnston, a son of the Mr. Barnston, already mentioned, and a chief factor at Norway House about 1854 was very fond of the cultivation of flowers and the study of botany and some very valuable specimens of natural history in the British museum are said to have been of his procuring. Collections of books were a great means of providing knowledge and contributing to amusement in the isolated northern trading posts. We have already spoken of the Athabasca library, founded by Mr. Roderick Mackenzie. 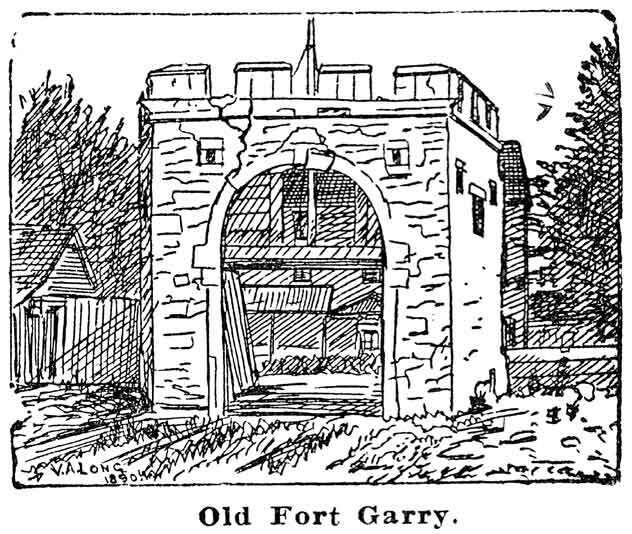 Harmon speaks in his journal of spending many pleasant hours in a library at the far distant Fort Dunvegan, on Peace River. Mr. Bernard Ross, a chief trader, after the union of the companies, and stationed for some time in the Mackenzie River district, left his library of 500 books behind him on leaving that region to be used for a circulating library. Peter Fidler, a trusted officer of the Hudson's Bay Company,-called a surveyor and trader-who died the year after the union, bequeathed his library of 500 books in his otherwise eccentric will to be used as a circulating library in Red River. This bequest of books was afterwards merged in what was called the Red River library. The Hudson's Bay Co. officers were allowed just so much space in the packets that came out from England by way of Hudson Bay' and it was no uncommon thing for them to have that space packed with literature instead of the luxuries they might have fancied. The Red River library had its headquarters in St. Andrew's parish, and was for circulation in the Red River settlement. It seems to have been chiefly maintained by donations of hooks by retired Hudson's Bay Company officers and other settlers. The council of Assiniboia once gave a donation of £50 sterling for the purchase of books to be added to the library. There was one characteristic of this library that it contained in its catalogue very few works of fiction. A short time ago two books were handed by a friend to Dr. Bryce for presentation to the Historical society, One contains the list of donors and subscribers to the Red River library, the other is the issue book. This library seems almost to have disappeared during the troubles of the transfer of Rupert's Land to the British government. About half of it was added to the provincial library, which was being purchased at that time, and was destroyed in 1875 by a fire that consumed the old parliament building's which used to stand near the site of the present post office. A few of the books that had been stored elsewhere are now in the library of the Historical society. In addition to libraries we find that at a later date in the history of the settlement literary clubs were formed. Bishop Anderson and his sister, who arrived in Red River in 1849 were instrumental in forming a Reading club for mutual improvement, for which the leading magazines were ordered. The Rev. John Black, the Presbyterian pastor, of Kildonan, who arrived in 1851, belonged to this club. Later still there was a literary club at St. Andrews, for which modern books were imported. This latter club had about three lectures during the winter season, given by leading men of the settlement The titles of a few of these lectures are still remembered. Bishop Machray gave one lecture on "David Livingstone," and another on "History as gathered from the words we use." Mr. Bernard Ross also gave a lecture, the subject of which has been forgotten. At the close of each season an entertainment was given to defray the expenses of the club, at which Mrs. Kennedy, wife of the late Captain Kennedy, of St. Andrews, presided at the piano. But we must now speak of more decided organizations for the promotion of culture in Red River. The Selkirk settlers had now (1821) gained a footing in the land and the banks of the Red River had become the paradise of retired officers of the fur-trading companies. Happy families were growing up in the homes of the settlement and education was necessary. A settled community made it possible for the churches and church societies in the home-land to do Christian work, both among the Indians and the white people, and to these institutions the settlement was indebted for the first educational efforts made. The Rev. 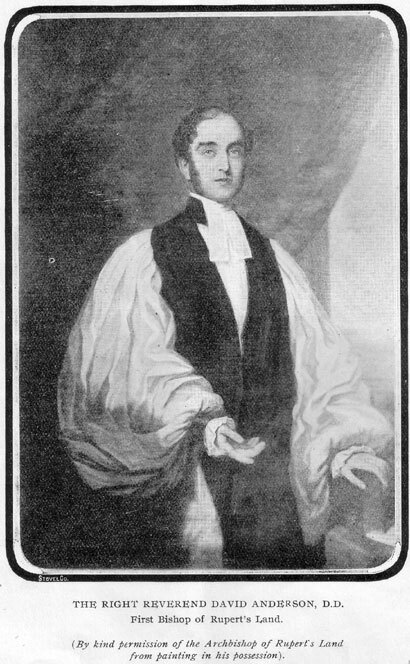 John West, the first Episcopal missionary who arrived, in 1820 and his successors, the Rev. David Jones and Archdeacon Cochrane, as far as they could, organized common schools on the parochial system. A visitor to the settlement in 1854 John Ryerson, says that there was then eight common schools in the country-five of them wholly, or in part, supported by the church missionary society, two of them depending on the bishop's individual bounty, and one only, that attached to the Presbyterian congregation, depending on the fees of the pupils for support. The governor and council of Assiniboia had, a few years before made an appropriation of £130 sterling in aid of public schools. The Hudson's Bay Company may be said to have given aid to these schools indirectly by making an annual grant to each missionary of an amount varying according to circumstances from £150 to £50 sterling. The Catholics had similar schools for the French population along the banks of the Red and Assiniboine rivers and the writer already quoted says that there were seminaries at St. Boniface, one for boys and one fur girls, under the Grey nuns from Montreal. Bishop Anderson, the first bishop of Rupert's Land, was not specially an educationalist. He turned his attention more to the evangelical work of the church. Bishop Machray who came to the country in 1865 has, on the contrary, whilst not neglecting the duties of a bishop of the church of Christ, always given great attention to education, and the country is greatly indebted to him for foundations laid. It was his endeavor after entering on his bishopric to have a parish school wherever there was a missionary of the Church of England, and in the year 1869 there were 16 schools of this kind in the different parishes of Rupert's Land. This is bringing us very near the time of the transfer when our public school system was inaugurated. But we must further turn our attention to what might be called higher education in Red River, although not using the term as it is applied in modern times. Mrs. Jones, the wife of Rev. David Jones, the missionary of Red River, joined her husband in 1823. She very soon saw the need there was for a boarding and day school for the sons and daughters of Hudson's Bay Co. factors and other settlers in the Northwest. A school of this kind was opened and in addition to the mission work in which she assisted her husband, Mrs. Jones devoted herself to the training of the young people committed to her charge until her death, which occurred somewhat suddenly in 1836. Mr. and Mrs. Jones were assisted by a governess and tutor from England and the Church Missionary society gave financial assistance. But we must not think that previous to this effort of Mr. and Mrs. Jones no attention had been paid to private education in the Northwest. We learn from the correspondence of Mr. Roderick Mackenzie after his retirement that there was a school at Terrebonne in Lower Canada to which a number of Hudson's Bay Co. officers sent their children, placing them under Mr. Mackenzie's surveillance. We hear also of sons being sent to Lachine and afterwards to Edinburgh Even after the opening of the school at Red River a number (if young ladies were sent to England for their education. Mi. David Thompson, the explorer and astronomer, who had married a young Indian girl when beyond the Rocky Mountains, writing to a friend in the province of Quebec says "I thank you for your esteemed favor of Sept. 9th, and am obliged to you for the traits of civilized life and for news of my daughter. She costs me £63 10s at present and I think £50 would do her all the good the present sum costs me. It is my present wish to give a11 my children a good and equal education. My conscience obliges, me to do it, and it is for this that 1 am now working in this country." He writes from Athabasca River, foot of the Rockies, 1810. Mr. John Macallum, who was afterwards ordained LA Red River, arrived from England in 1836, as assistant to Mr. Jones. He took charge of the school for young ladies and also the classical school for the sons of Hudson's Lay factors and traders. He was assisted by Mrs. Macallum and also had teachers brought out from England. He had two daughters who were pupils in the school, one of whom still survives in British Columbia. One of the Red River ladies who attended that school when a very little girl says that the building occupied by it stood near the site of Dean O'Meara's present residence. The enclosure took- in the pretty ravine formed by a creek in the neighborhood - the ravine that is now bridged by one our public streets It consisted of two large wings, one for the boys and one for the girls, joined together by a dining hall used by the boys. There were also two pretty gardens in which the boys and girls could disport themselves separately. The large trees that surrounded the building have long since disappeared. The young girl spoken of as a pupil seems to have had her youthful mind captivated by the beauty of the site, and indeed nowhere could the love of nature be better cultivated than along the bends of the Red River near St. John's, where groves of majestic trees succeed each other, where the wild flowers flourish in the sheltered nooks and the fire flies glance among the greenery at the close of day and where for sound we have the whip-poor- will lashing the woods as if impatient of the silence. Mr. Macallum's teaching and his care of his pupils were highly appreciated and his death which took place in 1849, was a serious blow to education in Red River. Almost simultaneously came the arrival of Bishop Anderson, who was just in time to conduct the funeral services. Among the governesses who book part in the work of these schools may be mentioned a Mrs. Lowman, a widow, who came from England. She married a Mr. Bird, a retired Hudson's Bay Company factor, who lived near Middlechurch and she was the mother of the late Dr. Bird, who in the early seventies was speaker of our House of Assembly. There was also a Miss Mackenzie a native of the country, and related to a number of the prominent families in Red River, who was first a pupil and then a teacher in the Macallum school. It is said that a number of marriages took place between the governesses brought from England and retired Hudson's Bay Company officers, and that the promoters of culture in Red River were much discouraged by having their educational investments thus speedily cancelled. The following story may be given as a Red River joke, but illustrative of this fact. With a view to exercising due caution in this matter, an accomplished lady in England, who had reached the mature age of eighty-five was approached with a view to having her services engaged for Red River, but when asked for a guarantee that she would not make any matrimonial alliance, she said, she did not know. If a rich Hudson's Bay magnate came along with proposals she might be induced to change her condition. The negotiations were broken off. After the death of Mr. Macallum a change was made in the arrangement of the schools for boys and girls. The boys' classical school was placed under the care of Mr. Pridham and Mr. Thomas Cochrane, son of Archdeacon Cochrane, Bishop Anderson also giving his personal supervision. After the retirement of Mr. Cochrane Mr. Colin Campbell Mackenzie was appointed as mathematical tutor in St. John's school. Mr. Mackenzie was a native of the country and had been sent to Cambridge university from which he, had graduated with distinction. After teaching at Red River for two years Mr. Mackenzie went to British Columbia where he was for some time principal of the boys' school in Victoria. In 18i8 he was appointed superintendent of education in the province which position he held for about six years. In 1590 he was elected to represent Nanaimo in the provincial legislature. Mr. Mackenzie died in British Columbia a little over a year ago. Contemporary with these schools was one commenced in the early thirties by Mr. John Pritchard, at one time agent of Lord Selkirk, at a place called "The Elms," on the east side of Red river, opposite Kildonan church. Mr. Pritchard was entrusted with the education of the sons of gentlemen sent all the way from British Columbia and from Washington and Oregon territories, besides a number belonging to prominent families of Red River and the Northwest. The governor and council of the Hudson's Lay Company granted to Mr. Pritchard a life annuity of £20 on account of his services in the interests of religion and education. At Red River in 1856. 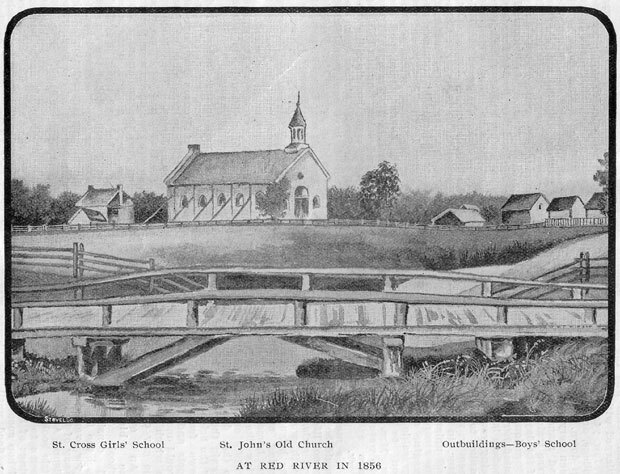 The Kildonan settlers had availed themselves largely of the educational advantages -afforded by this school and on Mr. Pritchard's retirement they endeavored to fill its place by the efficiency of their parish School on the west side of the river, conducted by the late Mr. John Inkster, brother of Sheriff Inkster, and his successor, Mr. Matheson, now Rev. Alex Matheson. The Rev. Samuel Pritchard reopened his father's school at the same spot, The Elms, in 1862. It was afterwards moved to St. Paul's parish and in 1866 it was amalgamated with St. John's boys' school, Mr. Pritchard and his pupils being received into that institution. On coming to the diocese in 1865 Bishop Machray reorganized the boys' classical school and it was opened as a high school in 1866. The bishop gave instruction in a number of branches himself, paying special attention to mathematics, Archdeacon McLean had charge of classics and the Rev. Samuel Pritchard conducted the English branches in what was now called St. John's college. In connection with the parish school of Kildonan the Rev. John Black, who was, as we all know, a scholarly man, gave instruction in classics to a number of young men, who were thus enabled to take their places in Toronto University and in Knox College, Toronto. In addition to these schools, Mr. Gunn, of St. Andrew's, afterwards Hon. Donald Gunn, had for a time a commercial school at his home for the suns of Hudson's Bay Co., factors and traders, so that they might be fitted for the company's business in which they were to succeed their fathers. From the death of Mr. Macallum, 1849 there was a vacancy in the school for girls until 1851, when Mrs. Mills and her two daughters came from England to assume its charge. A new building was erected for this school a little further down the river to which was given the name of St. Cross. This was the same building enlarged with which we were familiar a few years ago as St. John's Boys' college, and which has lately been taken down. Mrs. Mills is said to have been very thorough in her instruction and management. The young ladies were trained in all the social etiquette of the day in addition to the more solid education imparted. Miss Mills assisted her mother with the music and modern languages. Miss Harriet Mills being younger, was more of a companion to the girls, and accompanied them on walks, in winter on the frozen river, in summer towards the plain, and unless her maturer years belie the record of her girlhood we may imagine she was a very lively and agreeable companion. In addition to her regular school duties Mrs. Mills had a class for girls who were beyond school age. She also gave assistance in Sunday school work. We may picture to ourselves what would be the events of interest in the school life of that time, how the boys and girls, some of them from the far north, would watch for the passing of the brigades of York boats in the spring, saying, "These men will see our homes." The York boat with its wing like sail would seem to them as stately as the majestic merchantman to the denizens of a seaport town. Again they would look for the return of the brigades in the autumn bringing news from the distant fur-trading posts and the coming of the ice that would make of the river a highway in which their friends could travel in the gay comfort of a dog train. An event occurred early in the history of Mrs. Mills' school which must have caused considerable excitement. This was the flood of 1852, when the Red river overflowed its banks and drove many of the settlers from their homes. Bishop Anderson, who has written a little book called "Notes on the Flood," seems to have occupied one of the wings of St. John's Boys' school. The bishop speaks of the gradual rising of the flood until his library was endangered and it had to be removed into St. Cross, as being a new building and more likely to withstand the pressure of the water. The young ladies cheerfully assisted in the transfer but very soon Mrs. Mills and her youthful charges had to be removed to a place of safety. In 1856 Miss Mills was married to Francis Johnson, recorder of Rupert's Land, afterwards Judge Johnson, and for a time governor of Assiniboia, who, later still, was created Sir Francis Johnson, and a judge of the supreme court of Canada. It may have been noticed that Lady Johnson died recently in Montreal, having survived her husband several years. Soon after her daughter's marriage Mrs. Mills left Red river. She afterwards took charge of the Helmuth Ladies' college, in London, Ont. 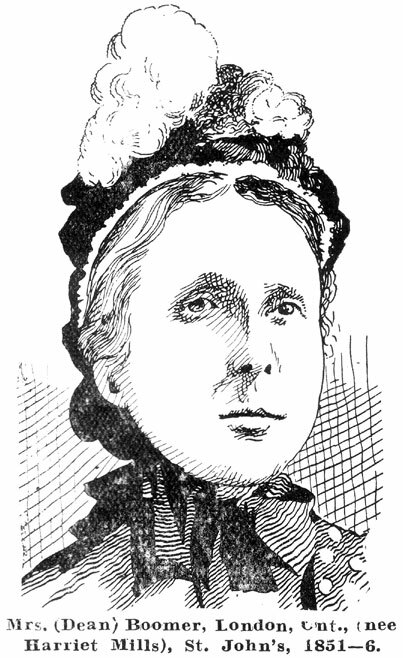 Miss Harriet Mills, though not Canadian born, yet from long residence, ranks among Canadian women authors. After leaving Red river she married a Mr. Roche, whom she accompanied to South Africa, and her book, "On Trek in the Transvaal," was published in London, Eng., in 1876. It is now out of print, but since the outbreak of the South African war, extracts from it have been re-published by the Canadian press. Mrs. Roche's second husband was Dean Boomer, of London, Ont. Mrs. Boomer is a prominent member of the National Council of Women of Canada and her racy humor and sound common sense give her a telling power in its meetings. She is also a member of the school board of London, Ontario, in which city she makes her home. The pianos used in these schools had to be brought by sea, river and portage by way of Hudson Bay; one of them is still in possession of Miss Lewis, St. James. The teachers from England had to traverse the same somewhat discouraging route in coming into the settlement. Miss Mills, who came alone a little later than her mother and sister, traveled from York Factory under the care of Mr. Thos. Sinclair. She always manifested the highest appreciation of his kindness to her during the way, making his men cut down and pile up branches around her to protect her from the cold when his party had to -amp out for the night. The departure of Mrs. Mills almost brings the annals of St. John's Ladies' college, as then constituted, to a close. It was continued for a short time under the care of a Mrs. Aldershaw from England, but its ex was finally terminated in 1858. From the beginning of Mr. Macallum's time the schools at St. John's seem to have depended chiefly on private enterprise for financial support. A pupil boarding at one of the schools paid at the rate of £30 sterling per annum. The Hudson's Bay Co., Sir George Simpson states, gave an annual grant of £100 sterling to help to maintain a school at St. John's, but possibly this was used in behalf of the boys' school. But, although a change thus took place at St. John's the young ladies of the north were not left without an instructress, and the arrival of Miss Matilda Davis whose early connection with the Northwest gave her a deep interest in its welfare, was most opportune. Miss Davis was the daughter of a Hudson's Bay Co. officer who was lost, in a mysterious way on an island in Hudson Bay, where he had landed when on his way home to England, accompanied by his family. His two eldest daughters had already gone to England for their education and the other members of the family after their father's death made their home at St. Andrews, Red River. The two Miss Davises in England seem to have been well trained in all the feminine accomplishments of the day and they were employed as governesses, it is said, in some of the prominent families of England. One of the sisters died and the other then resolved to rejoin her family in Red River. It is said that Miss Matilda Davis had always cherished the ambition of being well educated so that she might return to Red river and open a school for the benefit of her countrywomen. She commenced a school for young ladies at St. Andrews in the old family residence, building an addition to it for a school room and accommodation for her assistants. She had a Miss Lane as governess. At a later date Miss Davis erected a large stone residence for a boarding school, in which enterprise she was assisted by a grant from the Hudson's Bay Co of 100 sterling a year for three years. Many of the native ladies now resident in Red River were educated under Miss Davis' care and they speak of her with the utmost affection. Her school was continued till after the transfer and she died in the year 1875. The scene of her funeral is described by one of her pupils as most affecting. As many of her former pupils as could be gathered together were present to see her laid in her last resting-place, following the bier two and two in procession. Bishop Machray preached the funeral sermon and paid a high tribute to Miss Davis' missionary influence and educational qualities. "Red River," by Joseph Hargrave, the son of James Hargrave, already spoken of, not published until 1871. Adam Thom, LL.D., the judge and philosopher of Red River, from 1839 to 1854, was a prominent literary figure and a lecturer of these early days. Archbishop Tache wrote a sketch of the Northwest, published in 1870, and another work on Missions belonging to a later time. In 1859 was established the Nor'Wester newspaper, by Messrs. Buckingham and Coldwell, from which, although it was hostile to the Hudson's Bay Co., Joseph Hargrave quotes largely in his book on Hudson's Bay Co. affairs. Time and space have prevented us from including mission work among the Indian tribes in our subject and yet there are evidences of culture among the mission workers in the Northwest that should not be overlooked. The Rev. Archdeacon Hunter and Mrs. Hunter, as collaborators, translated the prayer book and part of the New Testament into the Cree language besides compiling a Cree grammar. Mrs. Hunter, who was a Miss Ross, from Red River, also translated a part of the English church 'hymnal into what is said to be very pure Cree. The Rev. William and Mrs. Mason, in like manner, translated the New Testament into the Cree language. Mrs. Mason was a Miss Thomas, from Red River, and when dying of consumption in London. England, she was propped up in bed to continue her labors, so great was her anxiety to see the translation finished. The Rev. James Evans a missionary of the Wesleyan Methodist church, to the Indians, is well known as the inventor of the Cree syllabic characters, which has alone so much to simplify the instruction of the Indian and is generally used throughout the Northwest. When Lord Dufferin was on one occasion shown a Cree syllabic testament he was lost in admiration, and said, "The nation ha, given many a man a title, a pension, and a last resting place in Westminster Abbey who never did half so much for his fellow creatures as did the inventor of that alphabet." The Rev. Father Lacombe has also added much to the study of Indian tongues by his French-Cree dictionary. Such were some of the efforts made to promote the higher intellectual life in Red River and the Northwest. They fully dispose of the accusation brought by someone against the officers of the Hudson's Bay Co. that "there was not a man among them that had a soul above a beaver skin." All honor to the men and women who thus faithfully endeavored to make the wilderness rejoice and blossom as the rose. The transfer of Rupert's Land from the rule of the Hudson's Bay Co. to that of the Canadian government brought many changes to the Red River settlement, but we of the present day owe much to that past regime. The educational ambition and literary taste of these early days have permeated our modern ideas and we can at least point to three of our prominent educational institutions as having had their root in "Early Red River Culture."